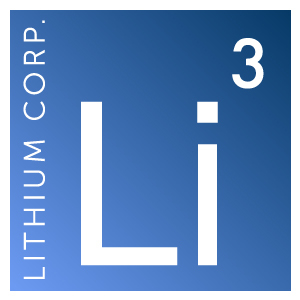 Elko, NV – January 24, 2018 – Lithium Corporation (OTCQB:LTUM) (“LTUM” or “the Company”), a North American company focused on energy metals for the growing energy storage sector and high tech industries, is pleased to announce that it has received the assays from its last round of work from the 2017 field season from the Yeehaw and Michael Tantalum/Niobium/Rare Earth Element (REE) properties in British Columbia. As previously mentioned in a press release dated August 10, 2017 earlier prospecting and sampling had resulted in the discovery of an approximately 100 foot (30 meter) wide zone of REE and titanium enrichment on the Yeehaw property. The latest round of sampling determined that the average titanium value in the zone is 0.88%. Several Rare Earth Elements exhibit anomalous concentrations in this zone with cerium being the strongest. However, more importantly the Rare Earths used in the manufacturing of the magnets critical to the tech revolution, neodymium (average 114 ppm), and praseodymium (average 33 ppm) are clearly elevated here. A number of other esoteric elements that are used in the tech industries, such as lithium (average 35 ppm), and niobium (average 92 ppm) are also present in this zone in anomalous concentrations. The latest work on the Michael tantalum/niobium property was limited to the lower elevations and soil sampling determined there is an approximately one half mile (800 meter) long zone of anomalous tantalum and niobium, with slightly elevated REE mineralization here. The Company is pleased with these results, and is presently considering its options with respect to further advancing these prospects.